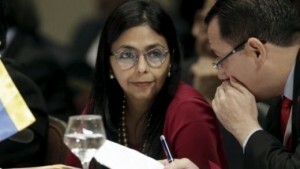 Former Foreign Minister Delcy Rodríguez who was sworn in as President of the Constituent Assembly. CARACAS - A new controversial Constituent Assembly has been installed in Venezuela, amid Opposition forces rallying thousands to hit the streets in protest. The 545-member body, elected in marred elections last Sunday, is headed by former foreign minister Delcy Rodríguez who was sworn in as President of the assembly today. The Constituent Assembly has the power to rewrite the constitution and dissolve state institutions, and will be seated in a chamber of the Legislative Palace in Caracas, where the Opposition-controlled Parliament normally convenes. It is also reportedly made up of President Nicolas Maduro’s staunchest supporters, including his wife and son. The new assembly has been strongly condemned by local Opposition forces who said it is nothing more than an attempt by the Maduro administration to grab power. International countries and organizations, including the European Union, some Latin American countries and the United States, have also frowned on the body, saying they won’t recognize it. Earlier today, Pope Francis urged President Maduro to suspend the Constituent Assembly which he says is fuelling “a climate of tension” rather than reconciliation and peace. However, Maduro has seemingly rejected the call. In response, the Opposition has pulled out government critics to march in the capital, heightening the probability of violent clashes between protesters and security forces. Over the last four months, Caracas has been rocked by violent protests which have resulted in the deaths of 125 people, and more than 5,000 people have been detained by security forces.